Why did TAFB implement the ‘Kate’ concept campaign? Akron Canton Regional Food Bank in Ohio shared the Kate video concept with the Feeding America network of regional food banks, to which Tarrant Area Food Bank (TAFB) belongs. TAFB decided to customize this video for the organization not only because of the impact of Kate’s message, but to also join in creating a sense of unity across the network. What are some of the strategic objectives you hope to achieve? AWARENESS. We would like Kate’s message to be shared all over our community, through our Partner Agencies, donors and volunteers, and the general public. As part of our annual awareness initiative, we hope the community learns that hunger and food insecurity exist right here in our own neighborhood and we, together, can do something about it. 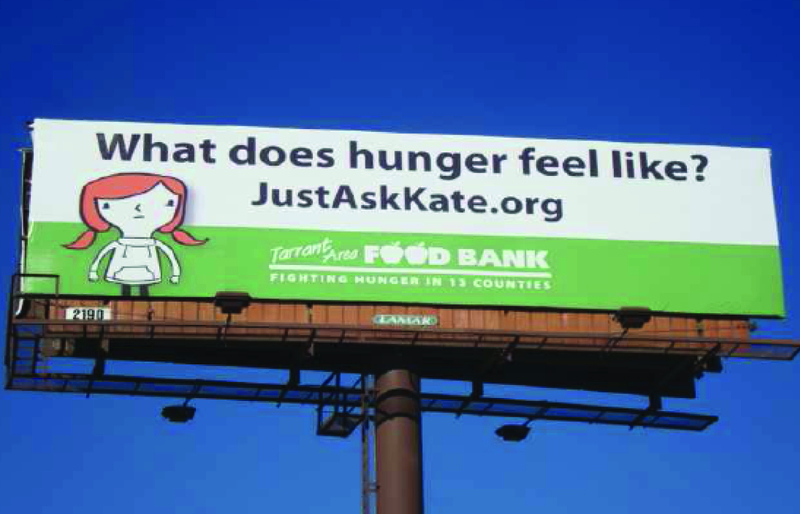 Through various print ads, billboards, and social media, we seek to increase awareness about hunger and direct people to the Kate video. We hope the Kate video and her message goes viral. The more that people share the video with their networks, the bigger the awareness of hunger we can create within our community. The video not only educates the public about the face of hunger–for example, Kate could be your next door neighbor, a co-worker or friend–but it also educates them about Tarrant Area Food Bank’s role in fighting local hunger. When did it start and how long will the campaign run? The campaign started mid-October and will run through December. We will do another flight of the campaign in the Spring of 2013. The Kate video will remain active on our website and on justaskkate.org and through social media when the campaign is not active. How would you say your version of the campaign differs from the original version? We are the first Feeding America food bank to launch a traditional marketing campaign around the video. 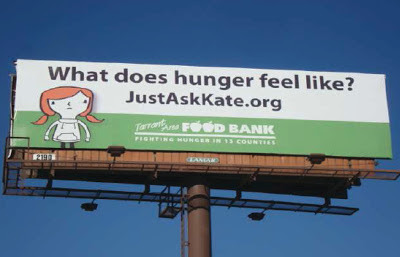 Up until now, the Kate video has been used as a tool in food banks for educating volunteers and donors and has been used through social media and word of mouth. What communication channels are you using to share Kate? Facebook and Twitter posts, Facebook ads, billboards, print ads in the Fort Worth Star-Telegram and Fort Worth Business Press, the Just Ask Kate web page, the TAFB website, YouTube, e-blasts, email signatures, volunteer training and exclusive showings at TAFB related events. We also have several collateral pieces our staff use for various audiences, such as children’s activities and giveaways, including Kate as a fan with suggestions on the backside for taking action to build awareness about hunger. Our life-sized Kate cut-out is being used for photo opportunities with key people in our community for posting on social media. How will you determine the success of this campaign? Because this is an awareness campaign, we are most interested in how viral the campaign becomes. The more video views, shares and likes we get from the Kate video, the more we know the word is being spread around our community. We have been using Facebook and Google analytics to track where our viewers are coming from and what actions they are taking after they view the video, such as visiting our website or liking our Facebook page. What do you think? Is this a compelling campaign to help generate awareness for the food bank’s fight against local hunger? As always, the comments are yours. The post is from the Next Communications blog. GFW PRSA will host a networking event for Masters and NuPros titled “Mastering a Brave New World” on Tuesday, Nov. 13 from 4:30 p.m. to 6:30 p.m. at Brownstone (840 Currie Street, Fort Worth, TX 76107). During the event, you’ll hear from a panel of experts about making the transition into the field of public relations from another profession or after time away in another role, position or industry. The cost is $10 per person, payable by cash or check at the door. This includes payment for your first drink and appetizers. RSVP by Monday, Nov. 12 to Masters Chair Kim Speairs at kim@balcomagency.com or NuPros Chair Cindy Vasquez at cindydvasquez@yahoo.com. Carroll Burney: Carroll took a hiatus from the world of public relations and marketing to pursue her love of cooking. She went back to school, received her degree in culinary arts and began working in the kitchen of a fine dining restaurant. Later, she began promoting a local chef. After several years in the business, Carroll decided to hang up her chef coat and go back to her passion – public relations. Today, she is vice president of Marketing and Development for Girls Inc. of Tarrant County, where she has been for four years. Jeff Rodriguez: Formerly a journalist with the Star-Telegram, the Cincinnati Enquirer and other papers, Jeff left the news world to pursue opportunities in non-profit work, including Big Brothers and Sisters. In January 2012, Jeff became a communications specialist with Texas Health Resources, and he now handles both public relations and internal communications for Texas Health Southwest hospital and for the Texas Health outpatient center in Burleson. Susan Schoolfield, APR: A PRSA Past President and Masters member, Susan worked for a local ad and PR agency and as a public relations consultant before joining the marketing and public relations department for Cook Children’s Health Care System. She stepped slightly away from PR for four years to work in sales for Dowden Custom Media. She returned to her PR and agency roots in 2011, when she joined the Balcom Agency as an account director. Those approved will join incoming President Chris Smith, Directors Margaret Ritsch, APR and Joe Stout, Assembly Delegate Holly Ellman, and Immediate Past President Allyson Cross. This slate will be voted on at the PRSA Luncheon & Annual Meeting on Nov. 14 at 11:30 a.m. at Colonial Country Club. For more information about the luncheon, click here. Even though the PRSA Southwest District does not have a district rep on the board (because no one ran), Blake Lewis, APR of Dallas was elected as National Treasurer. Blake will be an excellent “go-to” person for our district, if the need arises. PRServing America PRServing America is a competition for the best pro-bono community service project by a chapter. PRSSA can participate as well. For 1st place, the prize is $2,500 and the prize amounts go down from there. Our Chapter could think about a pro bono project that would be a possible submission for this recognition and reward. PRSA submitted an op-ed to Roll Call re: Senate inquiry into federal agencies and contractors payments to PR firms. PRSA advocated on behalf of PR pros being able to edit Wikipedia for clients. The owner of Wikipedia apparently was against this. The name of the Facebook group in favor of it is called Corporate Representatives for Ethical Wiki Engagement (CREWE). Get more PRSA advocacy news. Commission on Public Relations Education gave a lengthy presentation on the disparity of what colleges require for PR degrees. Currently PRSA National has 21,378 members. This is down from 2008 highs, but steadily climbing back up. Free webinars this year – 63 have been offered, with 6,500 participants, exponentially up from any previous time. Chapter resources – document sharing platform is being developed for online. No more chapters keeping stuff in shoeboxes! Next year, ALL Members will be able to pay dues quarterly for a $15 processing fee. This will be optional for chapters to allow members to do this or not. It may allow more members to join, but could affect chapter cash flow. Issues & Trends emails have been upgraded to be more user friendly and quickly read. Priorities for 2013 are Ethics, Diversity, Advocacy and the Brand: One PRSA. Value of Districts – upshot of discussion was that National should look at possibly re-drawing the Districts into smaller territories, separating it from board representation, or subsidizing districts to help pay for regional conferences. There are members who do not belong to Chapters, yet chapters fund the Districts, so some members are benefiting without contributing. Member Benefits – Districts could help aggregate benefit information for the Districts and provide it in a canned fashion for the chapters for newsletters, luncheon announcements, etc. Districts could help pen op-eds and localize the advocacy efforts of National for chapters to submit to their local publications. Many topics discussed and videotaped – National to condense and make available soon. Many delegates expressed concern that the Assembly did not vote on anything except the board slate. We listened to reports and gave feedback, but some did not feel the expense of the travel was worth being there in person, and did not feel the Assembly “accomplished” much. I predict if there is no “beefy” agenda next year, and only voting on board nominees, many chapters will send proxies vs. delegates unless they are staying for the conference. Thank you to Andra Bennett House, APR and Holly Ellman for representing the Greater Ft. Worth Chapter of PRSA as delegates to the Assembly during the 2012 PRSA International Conference.